Learn to knife throw, this came about as I used to have this on my twitter bio and when I was compiling my list thought I must actually learn to do this. Me, knives mmm what’s the worst that could happen??? 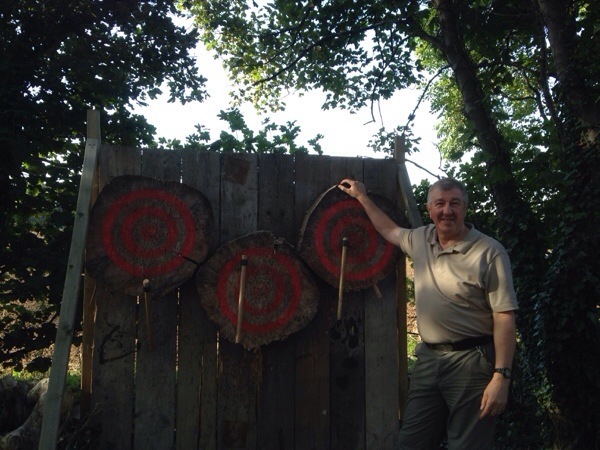 On the 27th September 2013 I took a trip to Pontefract and met with John Taylor who I had been arranging this session with over email and text, even though it wasn’t a regular club meet, John had opened up the throwing range just to fit in with me. I spent what must have been nearly 4 hours under Johns expert eye throwing a number of different ‘objects’. 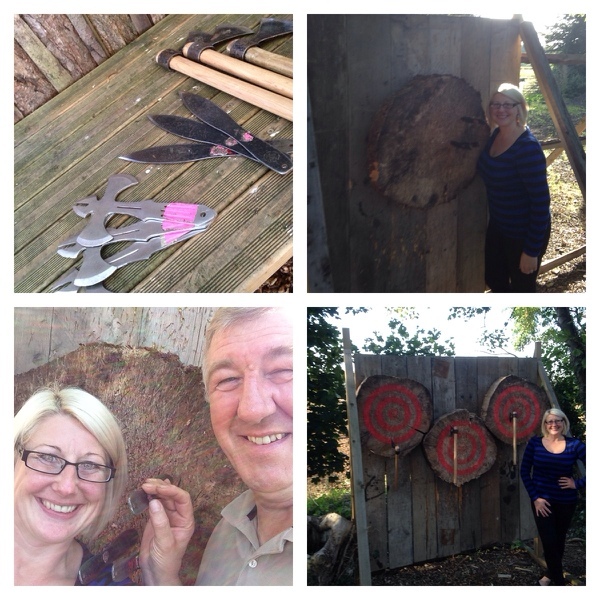 John, who lives in Pontefract, started the Knife Axe & Tomahawk Throwing Association (KATTA) to share his skills with other throwing fans, who have the chance to hurl knives, tomahawks, nails and other pointy items, in a safe environment. John played a knife thrower in an episode of Yorkshire TV drama, Heartbeat, advised documentary producers for the History Channel and taught knife throwing to actor Lenny Henry and Burlesque star, Anna Fur Laxis. I started out with the flying angels (kind of like a small axe) After a couple of attempts I started to get the hang of it. John’s shouts of “stop throwing like a girl” seemed to help me throw better. Apparently I’m an over thinker and threw a lot better when John distracted me with talking. This is very true and I like to do things to the best of my abilities!! Soon with a thought of bad memories to power my throw, I experienced the sheer delight of them actually sticking in the board and even managed a bit of finesse. The tricky part is learning to recognise what makes a throw successful and pinpointing it for replication. While the theory can be easily taught – knife grip, stance, the “follow through” – there’s an art to executing the perfect throw, which according to John, can take years of practice to perfect. So once I had perfected the angels it was onto the knives, each item you throw is a different weight. So a couple of practice throws to gauge where to stand and I was off. The grin on my face when they all stuck in the board. 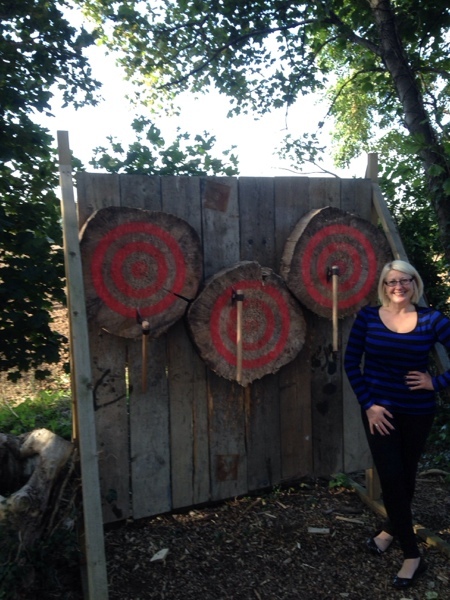 I found myself setting up and throwing again, that thud you get when a knife or axe sticks in a target is rather addictive. Then before we finished, John said ok Tomahawk axes next. These are so heavy and with a tired arm, I braced myself to throw. Second attempt and all three into the targets. John is such a wonderful teacher and thank you for giving up your time to help me tick this off my list. Gina. When you come to Japan I will take you to Iga-Ueno, the home of the Ninja, and you can test your skill at knife-throwing there.